It’s full S.T.E.A.M. ahead for Sanford Junior High School students! 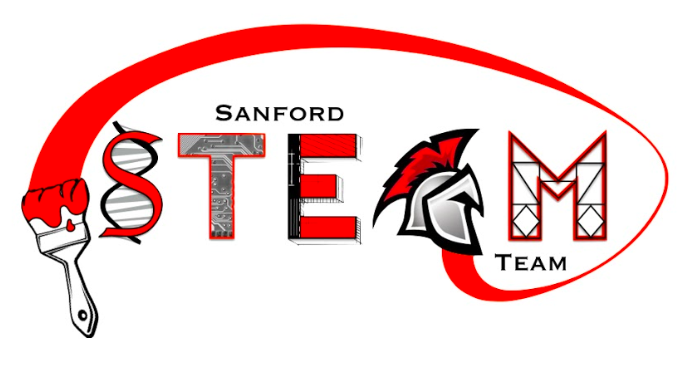 On Tuesday, February 5th the SJHS library will be buzzing with activity as students begin to learn about science, technology, engineering, art and mathematics in the most exciting hands-on ways! A Title IV grant has afforded students a unique after school opportunity that will run on Tuesdays and Thursdays at SJHS from 2 pm to 3:30 pm. Julie Williams, SJHS librarian, is spearheading the ‘STEAM Team’ program that is open to 6th, 7th and 8th graders at SJHS. Andrea Cole ( tech integrationist) and Lori Coleman (6-12 GT teacher) will be available to assist students. During the initial sessions, students will be introduced to a variety of materials and resources. They will be able to pursue an area of interest to develop. Video production, Lego Mindstorms, digital drawing and design and photo editing are a few of the great options available. A variety of resources to create animated videos, self-designed robots, and the opportunity to learn about circuitry will be available! Students will learn how to program Cozmo robot sidekicks, design robots using Lego Mindstorms and learn how to use 3D printers! If you know a 6th, 7th or 8th grader who is looking for a productive way to use time, then this is a great opportunity!